by the comfort of Thy grace may mercifully be relieved. The Station is in the venerable church of the Four Crowned (brothers); their names are, Severus, Severianus, Carpophorus, and Victorinus; they suffered martyrdom under the persecution of Diocletian. Their bodies, as also the head of the great martyr St. Sebastian, are among the relics of this church. The church of the Collecta, built in the seventh century, is the location for today’s Holy Mass. The church is the Station at the Church of the Four Holy Crowned Martyrs. Their relics are venerated in this sanctuary along with the head of the martyr St. Sebastian, an officer of the army of Diocletian. In the fifth century this church was one of the twenty-five parishes of Rome. By far one of the most structurally interesting churches in Rome, the Quatto Coronati may be linked to the ancient titulus Aemilianae, referred to by the First Roman Council of 499. It would then be one of the original twenty-five parishes of Rome. Scholars are uncertain about this, but they are sure about the reference to the church by the Roman Council of 595. It is also on the list of stational churches by Gregory the Great. Unfortunately, nothing remains of the original church. The present structure was built in the ninth century by Leo IV, who brought the relics of four martyrs to the church from the catacombs of Saints Peter and Marcellinus. They were four brothers, Severus, Severinus, Carpophorus, and Victorius, all Roman officials who were scourged to death under Diocletian (284-305) for refusing to honor a statue of the god Aesculapius. In 1084 Robert Guiscard sacked and burned the building. In 1111 Paschal II began restoring the church, but he decided to reduce its size, incorporating much of the old nave and its Ionic columns into a large courtyard, leaving the old atrium to form a forecourt. He also built the squat campanile which gives the approach to the church a fortress-like effect. Inside the church, the apse is now somewhat out of proportion with the present nave of the church. Paschal also added the galleries above the aisles which further reduce the sense of spaciousness. Of special note is the courtyard to the side of the church, entered through a door on the left side. An addition of Paschal, it is serene and contains a 12th century fountain, probably originally in front of the church. Now it the cloister for a nun’s convent and is not usually shown to the public, except on special days like today. Also to be seen is the Chapel of St. Sylvester which is located in the portico and right aisle of Leo’s old nave. It was built by Innocent IV (1243-1254) and has frescoes depicting the Last Judgment; also note the eight panels, in Byzantine style, recounting the legend of Constantine’s cure from leprosy by St. Sylvester, and the (inaccurate) tradition that Constantine was baptized by Sylvester. The cycle depicts the supremacy of papal power over imperial power, represented by the Holy Roman Emperor Frederick II. The chapel belongs to the confraternity of stonecutters and sculptors and is now rarely open. On the right side is the matronea, a gallery for women in Eastern style. Finally, do not miss the beautiful cosmatesque floor and coffered ceiling. 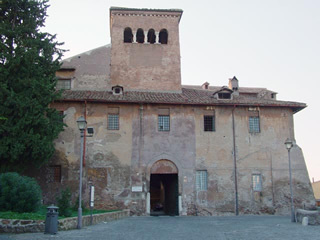 In the Middle Ages this church and its surrounding monastery formed the only fortified abbey in Rome and was often the temporary papal residence. Leo IV was proclaimed pope here in 847, but not, the story goes, until after the true identity of the infamous “Papessa Giovanna” was discovered. The discredited legend of Pope Joan is still linked to the church, because it lies on the old route of the papal cavalcade. Besides the relics of the Four Crowned Martyrs, the church also preserves the skull of St. Sebastian in an altar on the left side. The first non-Italian titular, Dietrich of Trier, was given this church in 975 by Pope Benedict VII. In 1914, Giacomo della Chiesa, who became Pope Benedict XV, was the titular here.